Strings in .NET are stored in memory as Unicode character data, using the UTF-16 encoding. (2 bytes per character, or 4 bytes for surrogate pairs). If you want to get access to the underlying data for the string in memory, you can use one of the functions listed below, indicating what encoding to use for the Unicode data when converting it to a byte array. If you use Encoding.Unicode, you’ll get the data exactly as it is stored in memory for the String type. In the example below, notice the different byte sequences used to encode the CJK character. 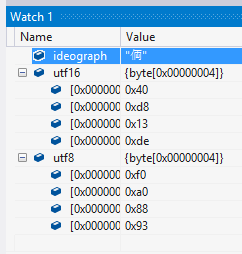 In .NET, string data is stored in memory as Unicode data encoded as UTF-16 (2 bytes per character, or 4 bytes for surrogate pairs). When you persist string data out to a file, however, you must be aware of what encoding is being used. In the example below, we use a StreamWriter to write string data to a file. StreamWriter by default uses UTF-8 as the encoding. We could also explicitly specify a UTF-16 encoding (Encoding.Unicode) when creating the StreamWriter object. UTF-16 encodes Unicode code points above U+FFFF using surrogate pairs that take up 4 bytes. You can also represent the surrogate pair within a string literal using the \Unnnnnnnn (4 byte) syntax to specify the Unicode code point or the \unnnn\unnnn syntax to specify the encoded surrogate pair value. Note that because a surrogate pair requires more then 2 bytes, you cannot represent a surrogate pair within a single character (System.Char) literal. UTF-8 is a character encoding scheme for Unicode character data that uses from 1-4 bytes to represent each character, depending on the code point of the character to be represented. In Unicode, code points for ASCII characters are equivalent to the ASCII code for that character. This mapping is true for all 128 ASCII codes. Characters included in the ASCII character set that are present in a stream of UTF-8 encoded character data will appear the same as if they were encoded as ASCII. This means that a UTF-8 encoded stream of ASCII characters will be identical to an ASCII-encoded stream of the same characters. I.e. For English language characters, UTF-8 is identical to ASCII.